Karachi - Oct 1, 2018: P&G recently hosted a Supplier Diversity Summit for women entrepreneurs in Pakistan in line with the Company's commitment to promote women's economic empowerment. The 2-day training workshop was attended by women-owned businesses from various service sectors, including transportation, event management, freight, corporate gifts, digital marketing and facility management, with training sessions covering a range of topics on business fundamentals. This included presentations by the P&G's leadership team, highlighting the importance of and sharing best practices on human resources, customer understanding, brand building, finance and taxation as well as legal and procurement. External digital experts, including a speaker from Google and an official trainer for Facebook, raised awareness about the social platforms and tools available for businesses to leverage and the positive impact inclusion of digital platforms can have for expanding business. The workshop concluded with key note speeches and a panel Q&A session with Mr. Stewart Atkinson, Chief Purchasing Officer, P&G, Mr. Sami Ahmed, Vice President, P&G Pakistan, Ms. Joelle Zilliox, Purchasing Director, P&G South Asia, Middle East and Africa and Mr. Khalil Benchekroun, Purchasing Associate Director, P&G Middle East and Africa. Promoting Supplier Diversity links directly to P&G's Gender Equality aspiration to build a better world for all – a world free from gender bias, and a world with equal representation and an equal voice for women and men. Globally, P&G has committed to expanding its supplier development program and integrate women- owned business in its sourcing supply chains across the world. In Pakistan, P&G is actively working to address gender bias, enable education for girls and promote women's economic empowerment through a range of corporate and brand programs. Despite the reported economic growth in the past few years, Pakistan is currently ranked 143 (out of 144 countries) in the World Economic Forum's Gender Gap Report. The percentage of women in the labor force is only 24% and in urban areas it falls to only 12%. Moreover, Pakistan has the lowest rate of women entrepreneurship in the world, with only 1% female entrepreneurs, compared to 21% male entrepreneurs. Access to viable economic opportunities and lack of knowledge are two of the main factors that have prevented women from engaging in entrepreneurial activities. Expressing his views, Sami Ahmed, Vice President P&G Pakistan, said, "We are steadfast in our commitment to empower women through P&G's Gender Equality initiatives and encourage women in society to take part in the social and economic development of the country. We are proud to have talented women participate in this workshop who will become the catalysts of a ripple effect by inspiring other women." He further added, "As we continue on our Supplier Diversity journey, we hope to help bridge some of the challenges faced by women-owned businesses through such training programs which provide necessary capability building for aspiring women entrepreneurs, enabling them to successfully grow and run their business." 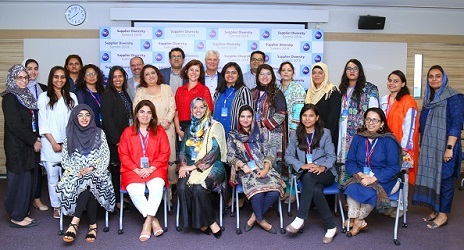 P&G Pakistan has been a corporate member of the US-Pakistan Women's Council since 2015 and is supporting the Council in its efforts to promote supplier diversity in the country. Through this partnership, P&G has provided training sessions for 100 women entrepreneurs in collaboration with the Council and WECREATE, aimed at counseling women entrepreneurs about how to successfully enter the corporate supply chain. P&G believes in being a positive force for good and for growth and continues to build Citizenship into how it delivers the business. Citizenship at P&G encompasses five focus areas: Ethics and Corporate Responsibility, Community Impact, Diversity and Inclusion, Gender Equality and Environmental Sustainability.